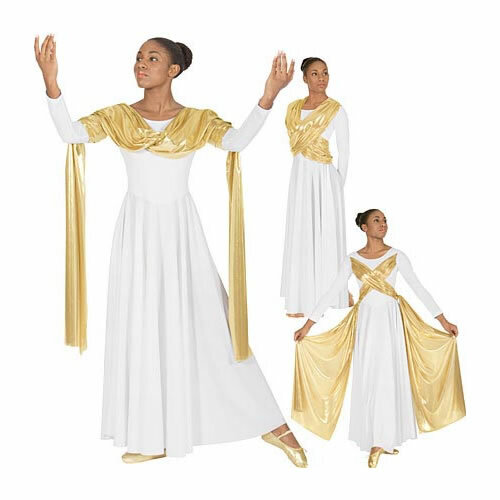 Unlike many other forms of dancing outfits, praise dance wear has to be modest and not draw attention to the body. The dresses of the women are normally long and flowing as it allows them to move better. For men, the pants are not close fitting and shirts are normally loose and worn outside the pants so as to make movement easier while providing a modicum of modesty. By whatever name you call then, praise wear or worship dance outfits, they all serve the same purpose – to help deliver the message of the Bible using dance as the medium. While dresses are the most common pieces for women, other garments include skirts suits, palazzo pants, tights, and scarves and yes, the right type of shoes if they are not dancing barefoot. For Hip Hop praise dancers the outfits of choice for both men and women are generally pants and tunics. Many also include ties and caps to complete the look. Material that drapes over the body and has fluidity when the dancer is moving is good for some liturgical dances as they help to add a touch of beauty to the movements. As with any other type of garment selection, it is also important to choose those that suit the body size of each dancer. Even if modesty is most important, the garments should be neat and attractive. 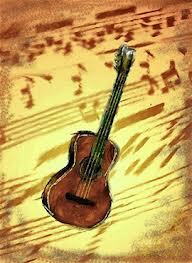 To put dancers in gaudy or ill-fitting outfits will only serve to detract from the performance. Sleeves: As a general rule, sleeves should be elbow length or longer so as to keep the arms covered. Necklines: Since any showing of cleavage is too sexual, garments for liturgical or worship dancing should keep the chest area properly covered. Many designers of these kinds of dancewear pay special attention to keeping this area of the female body concealed. Pantaloons, palazzos and culottes: Dancers normally wear these under dresses if they consider leotards and tights too close fitting or revealing. For dances that require lots of jumping and leaping, palazzo pants and culottes are best as they enable the dancer to maintain their modesty while remaining flexible and free in their movements. They are also safer as long flowing dresses can become trip hazards when a lot of leaping is necessary during a particular routine. Ultimately, when choosing your outfit you need to choose pieces that will serve the purpose, that is look divine. The right style and colors are important when choosing the outfits for the dance routines for different ceremonies and biblical stories. Finding pieces for individuals and groups is no longer a difficult task. Many establishments actually cater only to people needing worship costumes and other types of clothing stores also carry gear for the church set. It is possible to find the right garments at online sellers or from off the rack in many stores. 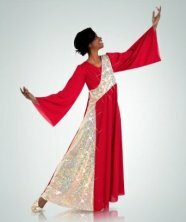 Some dancers, depending on their needs will even have their praise dance wear custom made. As with any other type of garment cost will vary depending on the type of material and where you buy your outfit. You can expect to pay anywhere from $20.00 up to a $100.00 or more for a dress. With accessories such as belts and scarves an outfit can cost pretty close to $200.00 for a woman. Dance praise wear can be colorful depending on the season or type of ceremony as those that require solemnity will be mostly white, black or purple. Ultimately, the outfit should not take attention away from the purpose of the dance, ministering about the Gospel of God.